Does your dog drag you around when you take him for a walk? Some dogs may pull harder than others, and it is important to discourage this behavior. Here are five ways to get your dog to have better leash manners. Use a head collar or front-attachment harness. This is best for an aggressive dog or a larger breed that has a smaller owner. It is best that these types of harnesses are used with shorter leashes. If the leash is too long and your dog pulls, it will abruptly end and cause them pain. 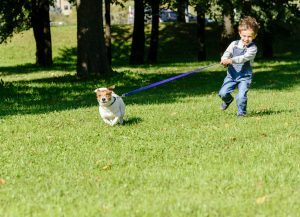 Use a longer rope or leash at first that is attached to a harness and reward your dog when he walks with you instead of ahead of you. This will provide incentive for your dog. Practicing this positive reinforcement will teach your dog to stay near you while walking. Hold on to your leash and take several steps backward from your dog. When your dog walks toward you, immediately reward them. Remember to have patience and practice this. In addition to rewarding your dog on your walks, practice this while changing pace. Walk a bit faster or slower than usual. Just as you did in steps two and three, reward your dog for following you. Over time reward them less often for good behavior. Use a shorter leash at this point. Let your dog get some exercise before you go for a training walk. This will tire them out and make them less inclined to pull. Then use positive reinforcement so that the behavior continues for future walks. As with any trick or training, practice takes time. Don’t give up if your dog doesn’t respond right away to your commands, and try these methods as well. If you begin to feel frustrated, pause your training and come back to it later. Good Luck!